Murray Mednick's FEDUNN, now in its world premiere run at the Odyssey Theatre, could have been brought up on truth in advertising charges. 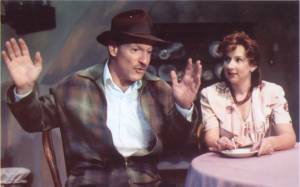 Billed as "a loving remembrance of the Catskills," with special mention of Grossinger's and Tamarack for their entertainment and food, the play promised something lighthearted and nostalgic. What it truly was, though, was a grim, dark, poetic drama about the impact of the Holocaust on the Jews. Instead of borscht, shav. Set in 1948 in the Royal Manor Hotel, FEDUNN is written in typical Mednick style: short, cinematic scenes that break off in mid-confrontation; characters who reveal themselves obliguely, if at all; an atmosphere steeped in mystery and menace. With its three act structure, fourteen characters and lack of dramatic focus, FEDUNN for all its earnestness and power seems like an early work of the playwright's, one that might have sat on his shelf for two or three decades. Tali (the excellent Maia Dansiger) is a concentration camp survivor whose physical and mental condition has been wrecked by the Nazis. 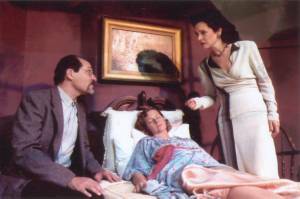 Bedridden and close to death, she is married to Ray (Michael Pasternak), one of the three Silverman brothers who own Manor House. The richest of the three is Leon, a Hollywood producer (and right-wing enemy of leftists in the industry), who returns on a visit and threatens to shut the money-losing resort down (though why a place like Manor House would be showing red ink in the heyday of the Catskills is never explained). Other storylines abound. Eli (portrayed vividly by Matt Gottlieb) is an intellectual Jew who, because of the Holocaust, questions his faith and the existence of God. Gina (Bari Hochwald) is a Polish Jew who, having survived the war by becoming the mistress of a Nazi officer, is haunted by guilt and shame. Murray C. (Mark Totty) is a gambler who served in WW II as part of a secret US military team that infiltrated occupied territory and assassinated collaborators. There's more, much more. Everyone who works at Manor House is up in arms against Fedunn (Zoltan), a young townie who delivers milk to the resort and has been snooping around with a pistol in his pocket. It's the Jews of the Catskill ghetto against an Aryan outsider, except that the delusional Tali imagines Fedunn to be the son she lost in the camps and begs for his life to be spared. Had Mednick focused his play better and not leapfrogged all over the place, FEDUNN might have become not just gripping but important. Instead it comes off as a scattershot study of Jews struggling to hold on to their faith and sanity in the wake of the Holocaust. Mednick's dozen-odd characters overburden the story with their individual problems and often bizarre behavior (one yelps like a wolf, for example, every time he enters). 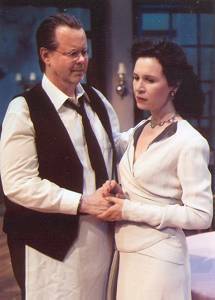 Mednick's play was hailed by some of LA's theatre critics (one of whom ranked it with Chekhov), but unfortunately this reviewer must say feh on FEDUNN.